Appleman Bicycles in Orange County, CA is the brainchild of Matt Appleman. After an injury called an end to his 10 year long bike racing career, he decided to pour the knowledge gained through his college Composites Engineering degree and work experience into building carbon fiber bikes. Today, he builds custom carbon fiber bikes to suit the stiffness needs of a rider. The base price for a frame, fork, and headset is $3,500 and this includes a standard "three panel" paint job. Besides bicycles, Matt has worked in the aerospace and wind energy industries. "From 150 ft, 13,000 lb wind turbine blades, to 2 lb bike frames... I've used composites to build them all!" he would tell you. Matt is a follower of my blog and recently contacted me to express his extreme satisfaction (or dissatisfaction) with my website. After having learned his credentials, I chanced upon the opportunity to shoot him a couple of simple questions on CF without getting into an erudite discussion. His reply is as below. If you have further questions after reading it, feel free to contact Mike through his website or start a discussion here. Me : Matt, you must be quite confident in carbon fiber's material properties for bicycle applications. I too believe in its benefits when properly applied. But when it shows its limitations, the consequences aren't so good. For the rest of us, tell us what makes a carbon fiber frame weak? MA : Well it depends on a bunch of factors. 1) Material Properties : The inherent weakness of carbon fiber is that it is brittle. Carbon fiber composites have low elongation (typically 1-1.5%). The brittleness of carbon fiber can be seen from sudden impact forces like riding into a curb or large pot hole. These impact forces can bend the frame/fork to the point of catastrophic failure. The frame needs to be sufficiently strong to absorb impacts and transmit the force throughout the frame. 2) Design (or lack thereof) : The “layup schedule” or the number of layers and direction of carbon fiber is the most important aspect to building a strong bicycle. For structure, bicycles use unidirectional carbon fiber meaning that all of the fibers run in the same direction (an isotropic material). Woven fabrics are typically cosmetic. Unidirectional carbon fiber is 30 times stronger in the fiber direction than perpendicular to the fibers. The angle of the fiber directly affects the strength of a frame! There are many forces applied to a bicycle while riding it and each tube resists a unique set of forces. Each tube requires a unique diameter, number of layers, and fiber directions. The true beauty of composites is that you can pick the direction of the strength. To save weight, material only needs to be added in a select number of directions. A carbon fiber frame with tubes designed with equal strength in all directions (anisotropic) would weigh at least twice as much and be overbuilt! Unfortunately, frames often fail because of forces not considered when designing the layup schedule. There is always a balance of weight and strength. 3) Manufacturing Methods : Then there are manufacturing methods. There are a 101 ways to manufacture a carbon fiber frame, but no matter how the frame is made, air voids can be present. Air is the true enemy of composites. Air can be trapped between layers of carbon fiber during the layup process. If the air is not removed prior to the resin curing, a void will form. For reference, a void content of <3% is considered acceptable in most composite industries. The void is a stress riser that enables cracks and delaminations to propagate. Whether failure occurs depends on the size and location void. Me : How do your bikes take care of this weakness issue? 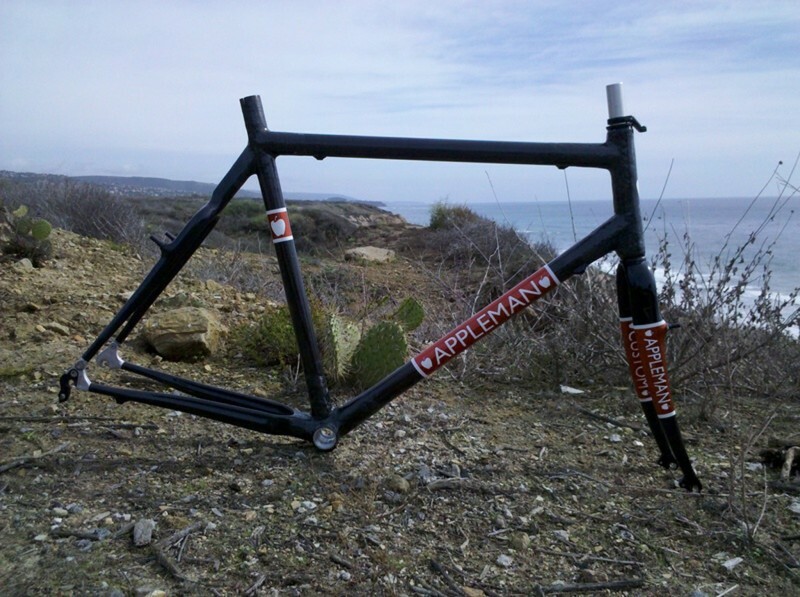 MA : Appleman Bicycles uses high strength carbon fibers and toughened epoxy resin. The carbon fiber is pre-impregnated with the resin to provide consistent resin content and low weight. By using a multitude of angles, the layup holds tubes together while transmitting loads and forces throughout the frame. The loads are distributed along the length of the tube as well as throughout the cross-section producing an extremely lightweight and robust structure. During my time working in the wind energy and aerospace composite industries, I’ve witnessed and developed hundreds of cure schedules. Using my background, I designed new cure schedules specific for my process of building bicycles. By using heat and pressure, air is extracted from the laminate prior to the resin curing. After the air is removed, consolidation of the layers of carbon fiber is realized until the resin is cured. Me : Thank you for your time! Why Some Carbon Fiber Is So Cheap?